Zimbabwe's President Robert Mugabe has won a seventh term in office, officials say, amid claims of electoral fraud. Mr Mugabe, 89, won 61% of the vote, against Prime Minister Morgan Tsvangirai's 34%. Mr Tsvangirai earlier said the elections for parliament and president were fraudulent and promised to take legal action. 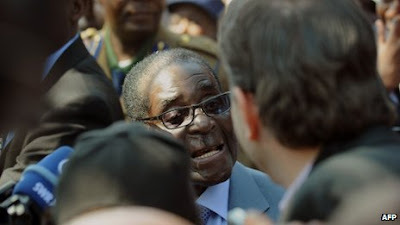 He said his Movement for Democratic Change (MDC) would no longer work with Mr Mugabe's Zanu-PF party. The two parties have been in a coalition since 2009, after the last election sparked widespread violence. Results from this week's parliamentary election showed the MDC had been trounced, winning just 49 seats compared with Zanu-PF's 158. In a news conference before the presidential result was announced, Mr Tsvangirai said Zimbabwe was "in mourning". "The fraudulent and stolen election has launched Zimbabwe into a constitutional, political and economic crisis," he said. He said he would produce a dossier of the alleged electoral fraud and he called on the southern African regional bloc, Sadc, to investigate. His MDC colleagues had earlier called for a campaign of civil disobedience to isolate Zanu-PF. The European Union, which maintains sanctions on Mr Mugabe and his senior aides, said it was concerned about "alleged irregularities and reports of incomplete participation" in Wednesday's election. Former colonial power the UK said it had grave concerns about the conduct of the election, and urged a thorough investigation of all allegations of violations. The US state department also called for an investigation and said the results were not a "credible expression of the will of the Zimbabwean people". Monitoring groups disagreed over the conduct of the election. The most critical account came from the largest group of monitors, the Zimbabwe Election Support Network (ZESN), which had 7,000 workers observing the vote.The organisation said problems with voter registration had left up to one million people unable to cast their ballots, mostly in urban areas regarded as MDC strongholds. On Saturday, one of the nine members of the election commission resigned over the way the election was conducted. Commissioner Mkhululi Nyathi said in his resignation letter: "While throughout the whole process I retained some measure of hope that the integrity of the whole process could be salvaged along the way, this was not to be." However, the African Union, which had 70 observers, said its initial report suggested the election was "free and credible". The AU's mission chief Olusegun Obasanjo said there had been "incidents that could have been avoided" and asked Zimbabwe's election authorities to investigate claims that voters had been turned away from polling stations. Sadc, with 600 observers, broadly endorsed the election as "free and peaceful", but said it would reserve judgement on the fairness of the process. Major Western groups were not invited to send observer missions. Mr Mugabe has been president since 1987. He became prime minister when Zimbabwe won independence from the UK in 1980.